Angel Al-cal is the identity which Alice Faye Hamilton expresses her artistic self and the wisdom that comes through her as an instrument of God. Angel Al-cal, is a unique angel with a spiritual gift of empathy— who delivers inspirational and thought-provoking messages of love, support, hope, and encouragement. Her mission is to inspire people to live a more authentic life by boldly expressing their uniqueness and true self. Al-cal, a name of endearment, was given by her father. Angel, is an expression of affection for the love she has for her mother. 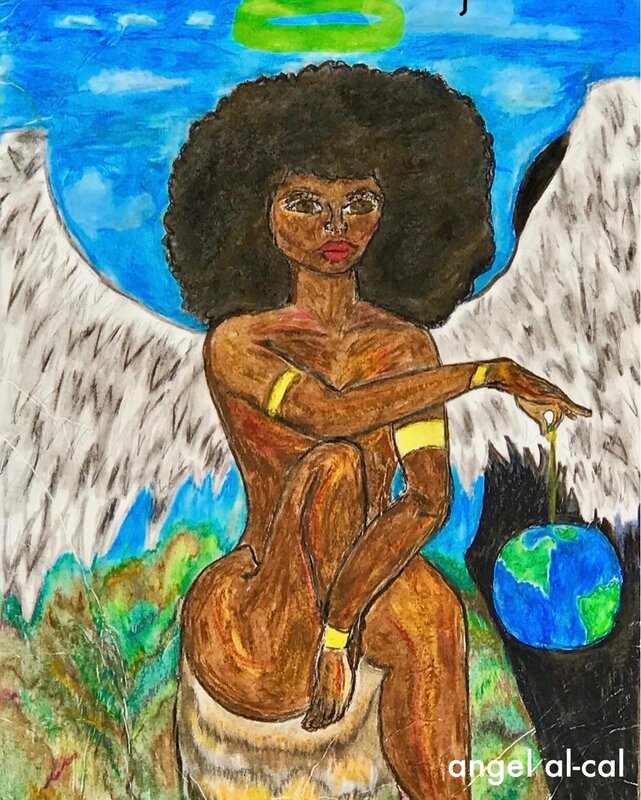 Her granddaughter designed the adult artistic image of Angel Al-cal, after sharing her 2016 cross-over death experience and rebirth journey. Many people have asked why you use the name and logo Angel Al-cal. I consider myself a messenger, an African American nappy-headed little girl Earth Angel spreading good news. I deliver messages of hope and remind individuals of who they are and their goodness and worthiness.